Analyzing the Vinland Map : What is the Vinland Map? 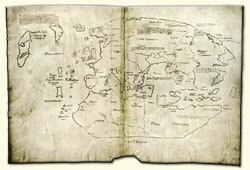 In the early 1960s, something called the "Vinland map" was uncovered. It became famous because it proved that Vikings came to America before Columbus. It seemed to be a map of the North Atlantic as drawn from Scandinavian discoveries between 800 and 1100 CE, well before western Europe's great Age of Exploration that began in 1400. It was announced by Yale University in the early 1960s, receiving much fanfare, and much skepticism. 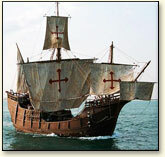 Schoolchildren in America are generally taught that Christopher Columbus discovered America in 1492, sailing from Palos, Spain on August 2, 1492, with the Niña, the Pinta and the Santa Maria (replica shown). On the right hand side of the map is the West European coast, including a quite recognizable Great Britain and Ireland, together with France, Spain and, at the top, Scandinavia. In the mid-Atlantic to the west of France and Spain were a group of islands that presumably represent the Azores. Then, in the North Atlantic, west of Scandinavia, are first Iceland, then Greenland. Most interesting of all, to the west of Greenland, there is drawn a large island that must represent that portion of North America explored by the Vikings, that was known to them as "Vinland." Vinland shows two large inlets, the northern one ending in an inland sea and seeming to represent Hudson Bay, while the southern seems to represent the Gulf of St. Lawrence. This map really does not affect our notions of the discovery of North America. The true discovery of the American continents came more than 25,000 years ago, in the depths of the Ice Age, by Siberian hunters who followed the mammoth herds into what is now Alaska. Undoubtedly, we shall never learn the details of this momentous expansion of the human range.